Food Politics has great writeup on the soda "ban" going into effect tomorrow in New York. Just to be clear, soda itself is not banned altogether, just the sale of anything larger than 16 ounces. While some people are actually opposed to this (unbelievable), this is a HUGE step in the right direction. As a nation there is no quesiton we are obese, unhealthy, and this seems to only be getting worse. I think soda has a large part of the problem. I see children all the time asking their parents for soda and actually getting it. This should not be happening! Children get soda at home and in schools and grow up thinking this is fine when it is really one of the most unhealthy things they can be consuming. Before you know it they are adults and have been drinking soda for most of their lives. UGH! I hope we see more restrictions like this and less fat children and adults. 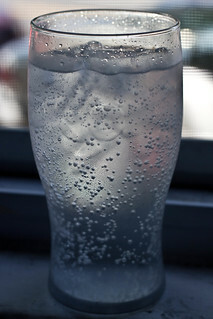 As a healthy alternative to soda, I suggest seltzer water, which comes in many flavors and no bad sugars or anything else for that matter. Lets compare the nutrition facts from a can of seltzer and a can of Coke. Could it be any more clear? Soda is TERRIBLE for you and at what benefit? What good does anyone really get from drinking soda? Why not drink a flavored seltzer that has no sugar or other bad ingredients? How about a refreshing bubbly water, not a "refreshing" death drink? For me this is true refreshment and it won't increase my chance of diabetes. Sounds like the measure was poorly written. I had conversations with friends about this today and a few said it would not go through that easily. Guess they were right.